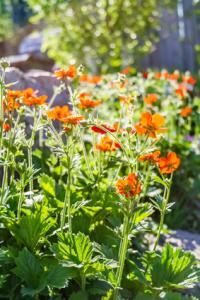 Geum is a petit perennial that holds its own in almost any flower border. Its low, deep green foliage is a pleasing backdrop for the tall stalks of dangling flowers that come in warm red, orange and yellow tones. 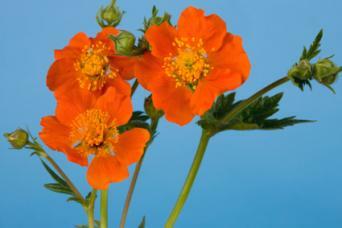 Also known as avens, geum grows in a small clump about 12 to 18 inches wide. While there are many wild species of geum, gardeners typically grow the hybrid cultivars, which all have fluffy double blossoms, usually one to two inches in diameter, with many layers of petals. Geum flowers are held above the evergreen foliage on wiry stems, giving them a light, airy feeling. They flower profusely in spring and then sporadically throughout the summer. Geum is also known for its seed heads. After the flowers fade, the seeds develop inside a unique structure with feathery gray tails. Geums are generally grown as a front of the border plant, where their low foliage and bright flowers make a cheerful edging to flower beds. Since it is a small plant, masses of one variety are very effective, though they can also be interspersed with other small-statured annuals and perennials for a cottage garden look. 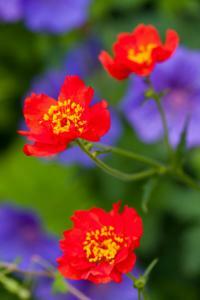 Geums are also excellent in potted arrangements and make great cut flowers. It's important to note that geums are short-lived perennials that require division every few years to renew the patch. Otherwise, they will naturally decline and disappear. The bloom period can be prolonged somewhat by deadheading. However, the foliage is evergreen in all but the coldest climates and can be allowed to remain through the winter. If the leaves are nipped by the cold, simply cut the plants to the ground - they will re-emerge in spring. Few pests or diseases trouble geum. Root rot, particularly in winter, can be a problem in wet soils. Powdery mildew can turn up in dry soil, especially late in the season. In all cases, diseased geum plants are a sign of improper growing conditions or simply the age of the plants. But as a short term fix, it's worthwhile to remove the infected foliage and allow fresh leaves to regrow. The main variation among geum varieties is flower color. Mrs. Bradshaw has extra-large, scarlet red blossoms. Lady Stratheden bears large double yellow flowers. Album has white to pale pink flowers. Georgenberg has orange-gold flowers and is known for blooming throughout the growing season. Double Bloody Mary bears double dark red flowers. 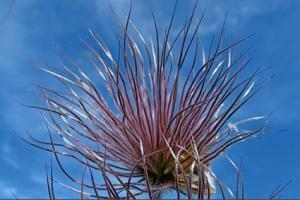 Prairie Smoke is a species native to the Midwest with decorative rose-colored seed heads. With its elegant jewel-like flowers and attractive foliage, geum is welcome in almost any garden bed or floral arrangement. It's not a tough-as-nails plant, but with basic care and decent soil conditions it will thrive with little effort.